Rockwood Lodges offers luxury self-catering accommodation in the indigenous forest of the private Karkloof Nature Reserve and tranquil Midlands farmland. Rockwood Forest Lodge and Rockwood Mountain Lodge offer utterly secluded luxury accommodation within the reserve itself, whilst Rockwood Farm Cottage and Rockwood Farm House are more centrally located upon Spitzkop Farm, which lies adjacent to the Reserve. All accommodation is serviced twice daily and guests will find a starter pack of basic condiments, linen, towels and amenities on arrival. 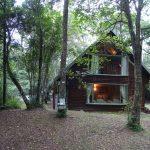 Activities in the area include mountain-biking, fishing, hiking and the Karkloof Canopy Tours. There really is something for everyone at Rockwood Lodges. Contact the reservations office at least three days prior to arrival should you wish to arrange a transfer to Rockwood Forest Lodge or Rockwood Mountain Lodge which is 4x4 access only. Family friendly: With more than enough nature-based activities for young and old, we invite you to come create your own adventure with us. Provisional bookings are held for 48 hours only during which time a deposit of 50% is paid to secure. Contact the reservations office at least 3 days prior to arrival should you wish to arrange a transfer to Rockwood Forest or Mountain Lodge which is 4x4 access only. We loved the tranquility and remote location of the cabin, nestled in with nature and only the sounds of the forest for company. The trails were well maintained and a pleasure to walk as a family (youngest of 7). The cabin itself was well appointed with everything we could want. Not a problem for us but if you are expecting perfection in an off the grid house then you may be disappointed with water temperature and pressure. Road up to the cabin was rough but manageable with a high clearance (not 4x4) vehicle. Great stay in an amazing spot, I could have stayed a month. Very thoughtful service - bottle of red wine, biscuits, coffee and milk available for consumption. Games, playing cards, magazines - everything one needs for relaxation. Swimming facility would be a great addition. We unfortunately were not able to stay at the Rockwood Lodge as there was a problem with the Gas. However the owner did help us find alternative accommodation. Thank you for that as we were stuck out of cellphone range and was great to hear an alternative was made. I am most grateful for the alternative arrangement and the effort they went to to ensure we had a place to stay. Thank you Cindy - Much appreciated. Wonderful forest, comfortable beds, good heaters for the cold and rain. We did enjoy our stay very much. The staff are very professional and friendly. Very nice environment. Will definitely come and stay again. Rockwood Lodges is 21.7km from the centre of Howick , the nearest airport 104.7km (King Shaka International Airport).